Winner of the 2017 Information Technology and Politics Division, American Political Science Association, Best Book Award in Information Technology and Politics. Taking Our Country Back: The Crafting of Networked Politics from Howard Dean to Barack Obama, Oxford University Press, July, 2012. Kreiss, D., & McGregor, S. (In Press). “The ‘Arbiters of What Our Voters See’: Facebook and Google’s Struggle with the Policy, Process, and Enforcement Around Political Advertising.” Political Communication. Kreiss, D., & Adams, K. (2019). “Navigating the brogrammers and the boys’ club: Women’s representation and experiences in political technology.” New Media & Society. Kreiss, D. (2019). “Digital Opportunity Structures: Explaining Variation in Digital Mobilization During the 2016 Democratic Primaries.” Digital Media and Democratic Futures, 42. Kreiss, D. (2019). “The social identity of journalists.” Journalism, 20(1), 27-31. Kreiss, D. and S. McGregor. (2018). “Technology Firms Shape Political Communication: The Work of Microsoft, Facebook, Twitter, and Google With Campaigns During the 2016 U.S. Presidential Cycle“ Political Communication. Kreiss, D., S. McGregor, and R. Lawrence. (2018). 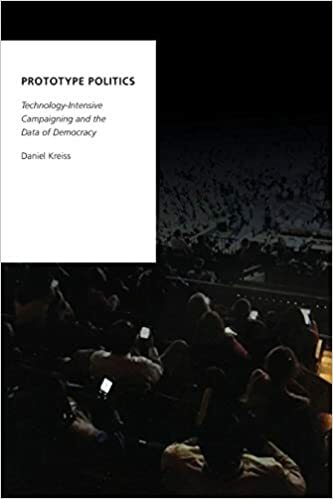 “In Their Own Words: Political Practitioner Accounts of Candidates, Audiences, Affordances, Genres, and Timing in Strategic Social Media Use.” Political Communication. Kreiss, D. (2018). “The Media Are About Identity, Not Information.” In P. Boczkowski and Z. Papacharissi (eds.). Trump and the Media. MIT Press. Kreiss, D. (2018). “The Networked Self in the Age of Identity Fundamentalism.” In Z. Papacharissi (ed.). A Networked Self: Platforms, Stories, Connections, Routledge. Kreiss, D., J.O. Barker, and S. Zenner. (2017). “Trump Gave Them Hope: Studying the Strangers in their Own Land.” Political Communication Forum. Kreiss, D. (2017). “The Fragmenting of the Civil Sphere: How Partisan Identity Shapes the Moral Evaluation of Candidates and Epistemology.” American Journal of Cultural Sociology. Kreiss, D. and A. Saffer (2017). “Networks and Innovation in the Production of Communication: Explaining Innovations in U.S. Electoral Campaigning from 2004-2012.” Journal of Communication. Kreiss, D. (2016). “Beyond Administrative Journalism: Civic Skepticism and the Crisis in Journalism.” In J. C. Alexander, E. Breese and M. Luengo, The Crisis of Journalism Reconsidered: From Technology to Culture. Cambridge, UK: Cambridge University Press. Kreiss, D. and C. Jasinski. (2016). The Tech Industry Meets Presidential Politics: Explaining the Democratic Party’s Technological Advantage in Electoral Campaigning, 2004-2012. Political Communication. Kreiss, D. and J.S. Brennen. (2016). Normative Theories of Digital Journalism. In C.W. Anderson, D. Domingo, A. Hermida, and T. Witschge (Eds. ), Sage Handbook of Digital Journalism Studies. New York: Sage. Kreiss, D. (2015). The Problem of Citizens: E-Democracy for Actually Existing Democracy. Social Media and Society. Kreiss, D. (2015). The Networked Democratic Spectator. First Issue/Manifesto. Social Media and Society. Karpf, D., Kreiss, D., Nielsen, R. K., and Powers, M. (equal authors) (2015). The Role of Qualitative Methods in Political Communication Research: Past, Present, and Future. International Journal of Communication, 9, 1888-1906. Kreiss, D. (2015). “Digital Campaigning.” In D. Freelon and S. Coleman (Eds. ), Handbook of Digital Politics. New York, NY: Edgar Elgar. Kreiss, D. and Welch, C. (2015). Strategic Communication in a Networked Age. In V. A. Farrar-Myers and J. S. Vaughn (Eds. ), Controlling The Message? : New Media in American Political Campaigns. (pp. 13-31). New York: New York University Press. Kreiss, D. (2015). Afterword to the Special Issue, “The Objects of Journalism.” Journalism: Theory, Practice and Criticism, 16(1), 153–156. Kreiss, D. (2014). A Vision of and for the Networked World: John Perry Barlow’s A Declaration of the Independence of Cyberspace at Twenty. In James Barrett and Niki Strange, Media Independence Working with Freedom or Working for Free? Routledge. Kreiss, D. (2014). Seizing the Moment: The Presidential Campaigns’ Use of Twitter During the 2012 Electoral Cycle. New Media & Society. Kreiss, D. (2014). The Virtues of Participation without Power: Campaigns, Party Networks, and the Ends of Politics. Special Section: Democracy Now: Ethnographies of Contemporary Participation Edited by Francesca Polletta. Sociological Quarterly, online first. Kreiss, D. and Meadows, L. (2014). Intra-movement Agenda Setting: Strategic New Media Messaging During a LGBT Ballot Campaign. In J. Girouard and C. Sirianni (Eds. ), Varieties of Civic Innovation: Deliberative, Collaborative, Network, and Narrative Approaches. (pp. 75-91). Nashville, TN: Vanderbilt University Press. Kreiss, D., Meadows, L., and Remensperger, J. (2014). Political Performance, Boundary Spaces, and Active Spectatorship: Media Production During the 2012 Democratic National Convention. Journalism: Theory, Practice, & Criticism. Anderson, C.W. and Daniel Kreiss. Black Boxes as Capacities for and Constraints on Action: Electoral Politics, Journalism, and Devices of Representation. Qualitative Sociology 34(4), 365-382, 2013. Barnard, Lisa and Daniel Kreiss. A Research Agenda for Online Advertising: Surveying Campaign Practices, 2000-2012. International Journal of Communication 7, 2046-2066, 2013. Ananny, Mike and Daniel Kreiss (co-authors). Responsibilities of the State: Rethinking the Case and Possibilities for the Public Support of Journalism. First Monday, 18(4), 2013. Kreiss, Daniel and Zeynep Tufekci (co-authors). Occupying the Political: Occupy Wall Street, Collective Action, and the Rediscovery of Pragmatic Politics. Cultural Studies ⇔ Critical Methodologies special issue, “What Happens When OWS Goes Home?,” 13, 163.167, 2013. Kreiss, Daniel. Acting in the Public Sphere: The 2008 Obama Campaign’s Strategic Use of New Media to Shape Narratives of the Presidential Race, Research in Social Movements, Conflict, and Change, 33, 2012. Kreiss, Daniel. Crowds and Collectives in Networked Electoral Politics. Limn, 2, 2012. Kreiss, Daniel. Yes We Can (Profile You): A Brief Primer on Campaigns and Political Data. 64 Stan. L. Rev. Online 70, 2012. Ananny, Mike and Daniel Kreiss (co-authors). Journalism For and By the Public: Creating a Free Press. Communication Currents, 6(6), 2011. Kreiss, Daniel. Open Source as Practice and Ideology: The 2003-2004 Howard Dean’s Campaign’s Organizational and Cultural Innovations in Electoral Politics. Journal of Information Technology and Politics, 8: 367-382, 2011. Kreiss, Daniel, Megan Finn, and Fred Turner. The Limits of Peer Production: Some Reminders From Max Weber for the Network Society. New Media & Society, 13(2): 243-259, 2011. Ananny, Michael, and Daniel Kreiss (co-authors). A New Contract for the Press: Copyright, Public Domain Journalism, and Self-Governance in a Digital Age. Critical Studies in Media Communication, First published on November 15, 2010. Kreiss, Daniel, and Philip N. Howard. New Challenges to Political Privacy: Lessons from the First U.S. Presidential Race in the Web 2.0 Era. International Journal of Communication, 4: 1032-1050, 2010. Howard, Philip N., and Daniel Kreiss. Political Parties and Voter Privacy: Australia, Canada, the United Kingdom, and United States in Comparative Perspective. First Monday, 2010. Kreiss, Daniel. Developing the ‘Good Citizen’: Digital Artifacts, Peer Networks, and Formal Organization During the 2003-2004 Howard Dean Campaign. Journal of Information Technology and Politics, 6(3): 281-297, 2009. Kreiss, Daniel. Appropriating the Master’s Tools: Sun Ra, the Black Panthers, and Black Consciousness, 1952-1973. Black Music Research Journal, 28(1): 57-81, 2008. Kreiss, Daniel. Performing the Past to Claim the Future: Sun Ra and the Afro-Future Underground, 1954-1968. African American Review 45(1-2): 197-203, 2012. Kreiss, Daniel, and Fred Turner. Future Shock. In Darity Jr., William A., ed., International Encyclopedia of the Social Sciences, 2nd edition. 9 vols. Detroit: Macmillan Reference USA, 2008. Kreiss, Daniel. Rebooting American Politics: The Internet Revolution. Review of Collective Action in Organizations: Interaction and Engagement in an Era of Technological Change. By Bruce Bimber, Andrew J. Flanagin, and Cynthia Stohl. iPolitics: Citizens, Elections, and Governing in the New Media Era. Edited by Richard L. Fox and Jennifer M. Ramos. Rebooting American Politics: The Internet Revolution. By Jason Gainous and Kevin M. Wagner. Perspectives on Politics, 2013. Kreiss, Daniel. Review of Raiford Guins, Edited Clean Version (Minneapolis, MN: University of Minnesota Press, 2008). Science, Technology, & Human Values, 2010. Kreiss, Daniel. Review of Jill Walker Rettberg, Blogging (Malden, MA: Polity Press, 2008). Journal of Communication, 59(2): E17-E21, 2009.